Get to the root of unwanted hair at Laser Me Clinic. Are you tired of tweezing, waxing and shaving your unwanted hair? Traditional hair removal routines can be tedious, painful, expensive and time consuming. Unwanted hair is common problem, for both men and women. Frequent hair removal chores including shaving, depilatories, plucking, and waxing are time- consuming, inconvenient and often painful. At best, these frequently used methods offer only temporary results – for some only a few hours. We can help you get at the root of the problem with laser hair removal with our state-of-the-art Cynosure Elite+ laser system. Laser hair removal gives you effective, permanent hair reduction anywhere on your body. Whether its your face, neck, legs, back or bikini line, you can have the results you want. Get to the root of unwanted hair, and book your free consultation now by calling 01244 630503 or book on-line below. How does Cynosure Elite+ laser hair removal work? 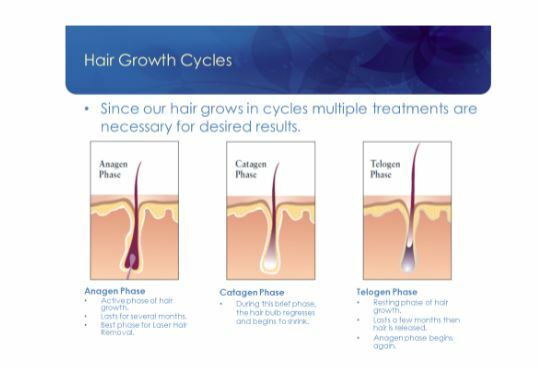 active growth phase when you are receiving treatments. technology, the Cynosure Elite+. The Elite+ uses two proven laser wavelengths that provide treatments for patients of all skin types. treatment for you based on a variety of factors such as hair colour and hair type. Yes. In fact, the area needs to be freshly shaved before your treatment session. before coming in for your session. But you should not wax or pluck the hair during the course of your laser sessions. Most people feel only a slight momentary “snap” at the treatment site during the procedure followed by a slight heating to the skin. This typically goes away after the treatment but cooling methods can be used immediately after treatment to help with this sensation. We recommend that you avoid heat treatments including hot baths, saunas, and steam rooms for 24-48 hours. You MUST avoid the sun and sun beds for 30 days before and after treatments. Factor 50+ must be worn to reduce this risk. be completely removed before the next session.